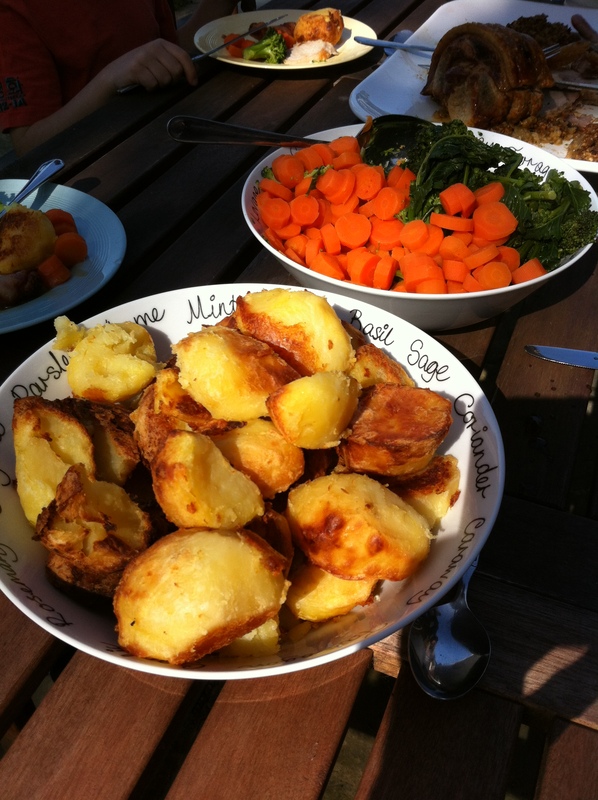 Rapeseed oil makes amazing roast potatoes! Rapeseed oil is a versatile ingredient in the kitchen, use it raw for salad dressings and dips, use it in baking and use it for its high burn point when roasting and stir-frying. Try our recipes, or let us know if you have your own! As heard on Channel Radio’s Scoff n Quaff Show! This is a good recipe for using up bananas past their best with just store cupboard ingredients. Preheat the oven to 190 deg C. Line a 12 hole muffin tin with muffin cases. Puree 3 bananas in a jug using a stick blender. Add one egg, 90ml Pure Kent Cold Pressed Rapeseed Oil, 90ml milk, 110g granulated sugar and stir well. In a separate bowl, mix 280g plain flour, 1 teaspoon baking powder, 1 teaspoon bicarbonate of soda and 1/4 teaspoon salt. Put the wet ingredients into the dry and give it a good stir. Spoon into the muffin cases—an icecream scoop works well. Bake for 15-20 minutes. Cool on a wire rack. If liked, decorate with some buttercream and chocolate strands or chips. Take some ripe tomatoes, in as many different shapes, colours and sizes as possible. Halve the little ones, slice the rest or chop into chunks. Heavily salt the tomatoes with sea salt, and allow to stand for 10 minutes. Tip away the salty juice. This will intensify the flavours. Sprinkle some dried oregano on the tomatoes. Make a dressing using one part balsamic vinegar with 3 parts Pure Kent Cold Pressed Rapeseed Oil. Add plenty of fresh ground black pepper. Drizzle the dressing over the tomatoes. Best served at room temperature with some basil leaves and some crusty bread to mop up the juices. Try making it with our Mild Chilli or Garlic Flavoured Cold Pressed Rapeseed Oils. Preheat the oven to 180 deg C. Line a 12 hole muffin tin with muffin cases. Zest and juice two oranges. Save a tablespoon or two of juice for making the icing. Mix 175g light muscovado sugar with 90ml Pure Kent Cold Pressed Rapeseed Oil, orange juice, zest, and any pulp. Stir in three beaten eggs, 140g grated carrot and 100g raisins. In a separate bowl, mix 175g self raising flour, 1 teaspoon bicarbonate of soda, 1teaspoon ground cinnamon, and 1/2 teaspoon grated nutmeg. Make some icing using the reserved orange juice and some icing sugar. Drizzle over your muffins and serve. This recipe is from our friends at Bath Harvest, who make Cold Pressed Rapeseed Oil on their family farm too! Pre-heat the oven to 190°c. Peel and cut a large butternut squash into 3cm cubes. Place in shallow, oven proof dish, drizzle with Pure Kent Cold Pressed Rapeseed Oil, and season with salt and pepper. Roast for around 20 minutes, until starting to soften and colour. Meanwhile, peel and chop a medium onion. Soften in a large saucepan with a glug of Pure Kent Cold Pressed Rapeseed Oil over a medium heat. Add the butternut squash and 500ml vegetable stock, bring to the boil and simmer until all the vegetables are cooked through. Take off the heat and leave to cool slightly. Give it a whizz with a hand blender. Add 1tablespoon grated parmesan cheese OR 1 tablespoon of peanut butter and stir through. Serve with crusty bread. These are quick and filling if you use our Strong Wholemeal Flour. Line a muffin tin with 12 muffin cases. Preheat the oven to 190 degrees C.
Toast 25g pumpkin and 25g sunflower seeds on a baking tray in the oven for a few minutes. Cool. In a large bowl, mix together 225g Pure Kent Strong Wholemeal flour, 2tspn baking powder, 1/2 tspn bicarbonate of soda, 2tspn poppy seeds, 1/2 tspn cinnamon and 115g Demerara sugar. Then mix in 80g dried cranberries and the toasted seeds. Make a well in the dry ingredients and add 250ml natural yogurt, 75ml Cold Pressed Rapeseed Oil and one egg. Mix well, until everything is incorporated. Using an icecream scoop, divide the mixture between the muffin cases. Sprinkle each muffin with some extra seeds and Demerara sugar. Bake for 20-25 minutes. Allow to cool on a wire rack. Recipe adapted from Cakes by Liz Herbert. For more recipes try this Rapeseed Oil web site, which can also tell you about all the health benefits too.